You are here: Home / News / Reserve your copy of two new books on World War I! The Goodhue County Historical Society is proud to announce the publishing of two outstanding histories that will commemorate the centennial of America’s entry into World War I. Pre-sales are currently available for books to be picked up or shipped upon arrival. The books are expected to arrive in early July. 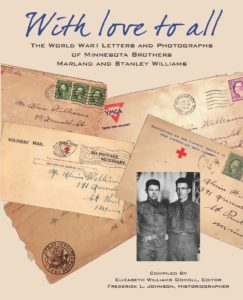 Assembled and published for the first time, the World War I photographs and letters of two Minnesota brothers, volunteers for the Great War, produce a compelling, personal narrative. In the aftermath of America’s April 1917 declaration of war, the two patriotic brothers, seventeen-year-old Marland Williams and his older brother Stanley, volunteered for duty. Marland signed on with what became the 125th Field Artillery of the 34th “Sandstorm” Division, among the first Minnesota units sent to Camp Cody, New Mexico, for training. His treasure trove of photographs and letters describe every aspect of the 125th F. A. during its nearly year-long training experience and journey to France. Stanley Williams enlisted as a member of the Minnesota 151st Field Artillery, part of the legendary 42nd Rainbow Division. Among the first to fight in France, Stanley and the Rainbow Division were in combat for the war’s duration, enduring many of its most costly battles. Compiled by Elizabeth Williams Gomoll, a granddaughter of Marland Williams, with background material by historian Frederick L. Johnson, these letters and photographs—more than 100 photos and images included—provide an intimate, inside view of life in America’s World War I army, and places readers in the boots of these two principled, dedicated Minnesota soldiers. Preorder With Love to All Today! Minnesota’s turbulent World War I years produced bloody conflict abroad and divisive ethnic and political tensions at home. Famed U.S. Supreme Court Justice Louis Brandeis, in comments on a Red Wing case, noted Minnesota’s “policy of repression” that resulted in the nation’s “most serious cases” of civil rights suppression. 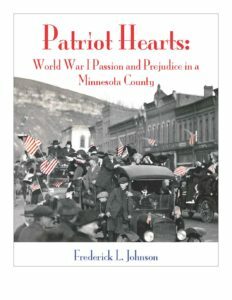 In his carefully researched study, historian Frederick Johnson retells this largely forgotten 1917-18 Minnesota story in microcosm, using the example of Goodhue, the state’s most ethnically and politically polarized county. Johnson’s richly detailed narrative is based on a wide range of primary sourced reports that detail verbal and physical attacks on German Americans and political rivals, nine indictments with four convictions for treason, courtroom improprieties, coercive Liberty Bond sales, and the use of martial law. The involving, fast-paced narrative, enriched by more than 100 images and documents, makes for compelling reading.